The mystery No. 1 man is identified. Or is he? Can you help us identify the persons shown in the photo from the 1950's? Here are some of the responses we have received sofar. No. 2 is Belfour Thomas's older brother. No. 3 is Jack Tye. No. 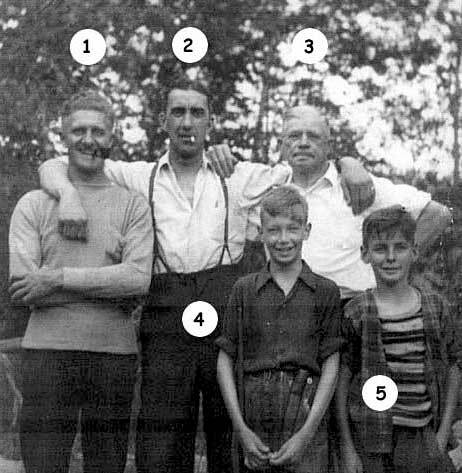 5 is Bert Caverson. I could be wrong, I often am. Here are some suggestions for the picture. 1. One of the Vaillencourts from Railway Ave.
#3 is John Tye, # 4 I think is Tye Plexman and # 5 looks like VanderGreen. #1 I do not know. I will bet you Reta Napier would know them all.